It has a Northernness that makes me feel at home. The people are like Yorkshire people, but more approachable. Dour, self deprecating types that know how to have a good time. I”m sure we’re all from the same stock at the end of the day. I’ve done business and pleasure in Dublin over the years and it’s a really good place to visit (Ryanair and prices apart) but it’s been through the mill economically recently and that definitely shows. The last time I was in Dublin was at the peak of the Celtic Tiger – well, things have definitely changed not just in Ireland but everywhere. We have clients in Dublin and we’ve been meeting them quite a bit so you might see a few more Irish posts in the coming months. Anyway, we had a couple of hours to kill so we had breakfast at The Clarence Hotel. Famously owned by Bono and The Edge from U2 it’s one of the city’s landmark hotels. Me being a U2 obsessive imagines bumping into Bono at breakfast or Edge at the shoe shine machine (perhaps) but the hotel does the landmark thing with a typical Dublin light under a bushel approach – it’s not fancy per se, just cool and luxurious in a worn and comfortable kind of way. Breakfast was highly reasonable and well sourced at £9 euros (what, eight quid) with good coffee and a roaring peat fire on a cold, rainy Dublin morning it was just the location we needed. Except there was no wifi and it was too early for Guinness – proving you can’t have everything. 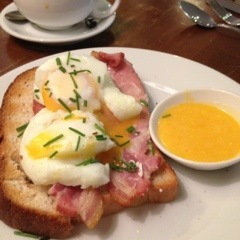 The breakfast in the Friars Lodge was limited so we ventured into town and went to The Lemon Leaf Cafe. Full Irish for Tony, bacon with poached eggs on toast for Pat, eggs Benedict for mysel and a bacon with sausage bagel for D. Oops forgot that D had porridge to start and I had granola. All the food was spot on but the service was very slow. However the cackling from across the cafe from the local girls made for noisy entertainment. We had a little drive over to Sandy cove which is very picturesque and the homes will make you jealous. We then blogged our way into the “the most spectacular golf course on earth” which turned out to be be underplayed because it was breathtaking. 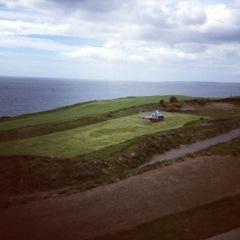 We had some drinks and a wander around The Old Head and saw how the other half live, note the helicopter. 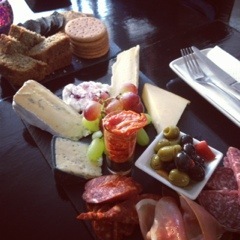 We needed a little sustenance and popped into a very smart wine bar called the Aperitif for a antipast platter which was superb. The girls had a glass of wine each but Tony and I shared a special bottle of Ferran Dria”s Estrelle. 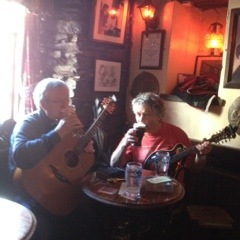 Our evening and final venue of the trip was a visit to the famous “Spaniard pub” to see Mick and Jimmy perform,. The weather was incredibly kind to us and the stroll around the estuary was very pleasant. 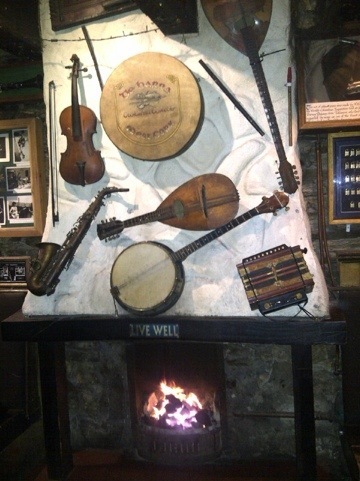 Straw strewn floors, open fires, locals joining in the singing,talk about the real Ireland! Pat, Tony, D and I decided to have a drive around the coast and found ourselves in the quaint town of Clonakilty. Of Clonakilty’s many pubs the most popular is The Barras which is famous for it’s live music events. Christy Moore, Noel Redding amongst others have played there. The pub is a full on traditional wood floor, low ceiling, real fire place with pictures of The Luisitania disaster and the Irish hero Michael Collins(probably Clonakilty’s most famous son) adorning the walls alongside musical instruments etc which create a great atmosphere. As with most pubs we found the place is a tardis, tiny entrance then thin and very long inside. As we were going out for dinner in the evening we shared a pizza between us and the obligatory Guinness’s. We will be going back next time we are across the water to get in some live entertainment. We all agreed that we need more proper pubs back home like The Barras. Fishy Fishy Cafe, And a night out in Kinsale. Our jaunt to Kinsale would not have been complete without a trip to it’s famous Fishy Fishy Cafe. There were eight of us dining so we gathered for a quick pint at The Greyhound pub or as Tony calls it The Black Dog. The restaurant is very contemporary in design, light and airy. We all sat at a long table in the window and ordered some Rose and a rather nice Alborino to go with the fish dishes. 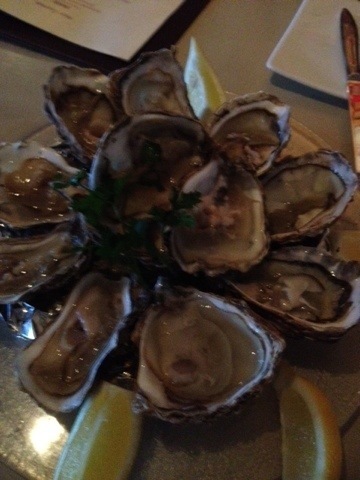 Tony and I shared half a dozen Oysterhaven oysters which were superb. Those of us who included myself and stuck to the signature Fishy Fish pie we were all pretty delighted but Tony, Pat and D had, Crab Claws, Pan fried Seabass, Fish and chips and were all a little disappointed, perhaps the hype increased the level of expectation. However the freshness and quality of the produce is such that we will definitely keep this as a firm favourite. band. From there it all get’s a little hazy but The Lord Kingsale comes to mind with a middle aged crooner bringing a little respite to the ears. Final stop was the White House and chats with the locals about football. Stagger back up a short hill to our accommodation The Friars Lodge. The town was still buzzing and as the Irish say we had a good craic! First night in Kinsale spent at the Bulman at Summercove. The views over the estuary on the taxi ride down were stunning. The Bulman pub was buzzing when we arrived and we had a couple of drinks downstairs before going upstairs to the restaurant. Gurdev and Tony shared a dozen oysters as a precurser.They certainly looked good and the guys said they were exceptional. 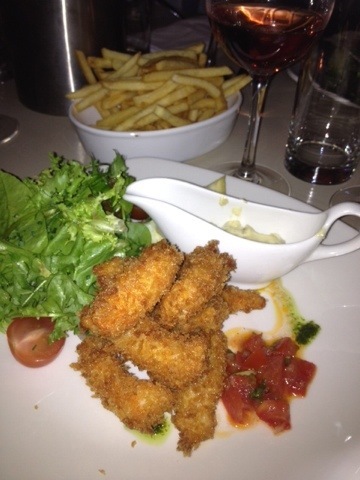 That was followed by starters of scampi, spare ribs in a sticky honey sauce(very nice Dawn says) and crab gratin. 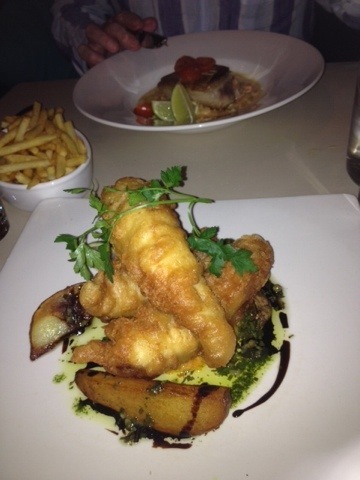 The mains included monkfish in tempura batter for Gurdev and seared tuna for Tony. We didn’t have desserts but followed with cheese and that was the only disappointment ( it was served too cold) in an otherwise excellent first night in The Emerald Isle.